Frederick G. Krause, 94, of Merrill, passed away on Thursday, January 10, 2019, under the care of his family and hospice services. Fred was born November 23, 1924, in the Town of Corning, son of the late Frederick and Anna (Berndt) Krause. Prior to World War II, Fred had been employed as a welder in the shipyards in eastern Wisconsin. During WWII Fred honorably served in the U.S. Navy from 1942 – 1946, and was stationed in the South Pacific. He helped transport troops to and from the Philippines and Pearl Harbor, Hawaii. After the war Fred worked briefly with the Lincoln County Highway Department. He then went to work at Drott Manufacturing, Wausau, as a welder, and at the time of his retirement, he was a Tool & Die Maker for J.I. Case. Fred always enjoyed being outdoors, whether it was deer hunting and fishing, snowmobiling, making firewood, or taking care of his lawn. 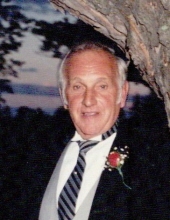 Fred is survived by two daughters, Deborah (Dragos) Zeicu, Green Acres, Florida, and Daria Corroo, Merrill; two sons, Kevin Krause and Kallen (Lisa) Krause, both of Weston; four grandchildren, Amy (Shannon) Bird, Wausau, Angelique Sandas (Tracey Lee), West Palm Beach, Florida, Andrea (Cory) Tomas, Eau Claire, and Jenna Krause, Weston; seven great grandchildren, Kazzy, Galen, Alec, Payton, Taylor, Ryle, and Halcione; and one sister, Bernice Teskey, Merrill. Besides his parents, Fred is preceded in death by a son in law, James Corroo; and his siblings, Dorothy Koehler, Alma Volz, Lauretta Zemke, an infant sister, and David, Alvin, and George Krause. There will be a Prayer Service for Fred at 7:00 PM Thursday, January 17, 2019, at the Taylor-Stine Funeral Home, Merrill. The Rev. Kyle Carnes will preside. Visitation will begin at 4:00 PM Thursday at the funeral home. Private Family entombment will take place the next day at Restlawn Memorial Park, Wausau. Online condolences may be made at www.taylorstinefuneralhome.com. To send flowers or a remembrance gift to the family of Frederick G. Krause, please visit our Tribute Store. "Email Address" would like to share the life celebration of Frederick G. Krause. Click on the "link" to go to share a favorite memory or leave a condolence message for the family.